Seasoned investors like Howard Marks profess to not being very good at forecasting the future but attempt to understand the current environment to prepare for risks. When cyclical risks are elevated he has a greater focus on preserving capital. While there are good reasons for many ‘growth’ stocks having structurally higher earnings growth, investors sometimes forget that the rate of earnings growth is cyclical. To be clear, earnings do not have to go backwards (as they do for value traps) but just need to be revised down for investors to worry. The combination of high valuation multiples with greater uncertainty about earnings growth is all that it takes for a share price to collapse. In August 2018, Apple seemed like it could do no wrong. It was trading on its highest PE multiple in 8 years, at 17x with 3-year forecast earnings growth of about 17% per annum. Then, in early November at its 4th quarter results, Apple hosed down investor expectations citing emerging market uncertainty affecting iPhone sales. Now, the 3-year forecast earnings growth has been revised down to 12% per annum with the stock trading lower on a 14x PE multiple. Even the world’s greatest investor, Warren Buffet, who bought at elevated stock prices could not stop the share price slide. Apple’s recent earnings revision highlights that while its earnings have consistently grown, the rate of growth is cyclical, linked to the health of the global economy. It wasn’t long ago, in 2016 when global growth was weak, that Apple revised down earnings expectations significantly. During that time, Apple traded around a 10x PE multiple with net cash of about $150 billion on its balance sheet. Apple will not be an isolated case. If a trillion-dollar market cap company can feel the effects of a global slowdown then it’s a sure bet that other companies will eventually experience something similar. In Australia, there are many technology stocks that will not be immune from a cyclical slowdown. Currently, there is a strange disconnect between the market being bearish on Aussie banks because of lower credit growth while many technology stocks are richly priced. The truth is that the economic consequences of low credit growth extend beyond just the banks, and it will permeate through most areas of the Australian economy. Even Afterpay Touch is not bulletproof when consumer bad debts spike, if economic growth slows dramatically. Aussie technology stocks will fall off the PE cliff when cyclical risks appear. So be warned … if you accept the view of lower credit growth in Australia then the investment case for many technology stocks are extremely risky. Their high PE multiples are not factoring cyclical risks in the economy. 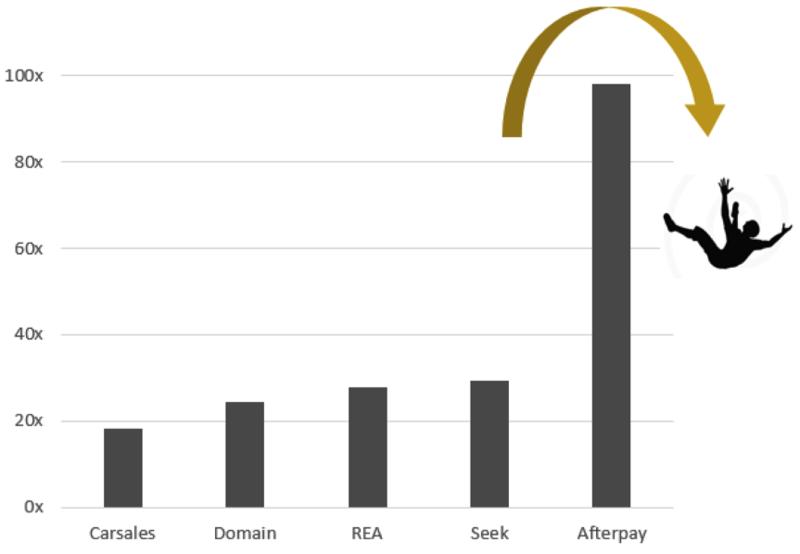 I think your view on Afterpay is going to prove very wrong in time, as IMO it isn't appropriate or rational to value a scaling high growth business on EPS multiples as if it is a mature business like REA or SEK; especially when it is reinvesting all profits back into growth. On that basis, Amazon would have been "crazily overvalued" all the way as it moved from $100-$2000. FB and Netflix? Tesla? Even if you look since last Friday the 16th of November, the ranking of the USA Afterpay App on google in the finance section moved from 108 to 99. It entered the top 100! It was at position 462 on October 17 and 211 on the 6 November. So it gained more than 100 places in just 13 days. Maybe when it is just behind Paypal people will finally consider the FA on this stock. They stated they have 2300 signed up retailers in under 6 months since launch and 300,000+ customers. That is viral growth. That isn't 12% yoy and a pe of 17 like Apple etc. This is also without it being valued on the basis of its value as thew new first touch credit bureau for millenials or its big data value or the fact it is setting up a marketplace via the APP, including with Instashop feature. Hell, even Kyliecosmetics has signed up in USA and tweets about it and I believe that her posts cost $1m when you actually pay for them. I also disagree with your view on credit growth, as this is so far from credit that it isn't even currently regulated as credit. Afterpay appears to be replacing traditional credit and as a zero cost option if you pay on time, is far cheaper for the consumer than a credit card. Most of their transactions are on debit cards. I could go on but I respectfully suggest that you reconsider or update your view after the AGM this month or the FY results next year. This is such an Aussie success story and everyone is chomping at the bit to drag it down. It is no wonder we have so little innovation on the ASX as a % of market cap. DYOR and don't rely on me as this is my opinion only. Seek independent professional financial and legal advice before making any decisions. @Simon James - No one is writing off Afterpay. But it comes down to the probability of you being right at buying Afterpay at current multiples. Of course, at hindsight AMZN doesn't look 'overvalued' 10 years ago, but that is if one is right about the prospect of Afterpay. What is your probability that Afterpay will be like AMZN? Or could it be another Bluesky? Slater Gordon? BigAir? What you mentioned i.e Google rank, tweets, big data, these are all narratives just as I can craft narratives that shine a negative light on the stock. No one is chomping down success story either. But if you want to become a better investor, you should be more interested in listening to contradictory view than defending what you believe is true. Take in what Jason is saying, weigh the evidence and revise your probability accordingly. @simon Afterpay is no Amazon. It has multiple competitors. Even square v and ma are working on same model. In 2 years this model will be crowded like crypto.